Edna Buckman Kearns was a grassroots suffrage organizer in New York City and Long Island, a Quaker writer and speaker best known for her “Spirit of 1776” suffrage campaign wagon, a symbol of the movement’s patriotic protest theme. The “Spirit of 1776” suffrage wagon was on exhibit at the New York State Capitol in Albany, NY during March 2017 and then again at the state museum from November 4, 2017 through May 13, 2018. PHOTO OF “SPIRIT OF 1776” SUFFRAGE WAGON UNCOVERED IN 2015: Special program on Suffrage Wagon Cafe. Overview of the life of Quaker suffrage activist Edna Buckman Kearns (1882-1934). PDF Marguerite Kearns, editor of Suffrage Wagon News Channel, is a journalist and the granddaughter of Edna Kearns. Public radio features Marguerite speaking about Edna and Inez Milholland, America’s suffrage martyr. Edna Kearns (1882-1934) learned newspaper reporting and editing when serving as press chair for New York Quakers. Later, she wrote and edited suffrage news for the Brooklyn Daily Eagle and other New York City metropolitan papers. Edna developed close relationships with news editors who published her many columns and reports. During the 1915 NYS suffrage referendum campaign, she submitted news to as many as 20 papers on Long Island and in New York City. Photo: Above July 4, 1913 in Long Beach, NY image from the collection of Rose Gschwendtner showing Edna Kearns far left; little Serena Kearns far right and unidentified woman in the middle). The wagon today is in the collection of the New York State Museum. 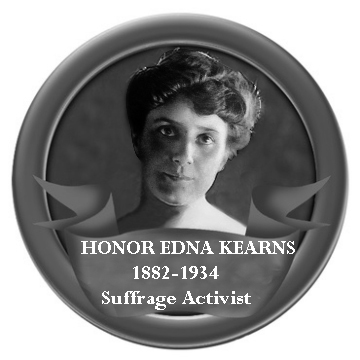 From 1910 to 1920, Kearns worked intensely as a speaker, as a press chair for local and state suffrage campaigns, and a movement organizer on Long Island and in New York City. Edna Kearns and her husband, Wilmer, a “suffragent,” were members of the Quaker Meeting at 15th and Rutherford Streets in NYC, as well as the “Friends Equal Rights Association,” a group of Quakers who marched under the banner of equal rights in NYC and Washington, DC suffrage parades in order to insist that all people be represented in votes for women organizing. The equal rights association of Quakers or “Friends” had been active since the turn of the 20th century. The influence of the Religious Society of Friends was strong in NY, with other Quakers from other states involved. My grandmother, her mother, and little Serena wore the Quaker bonnet and long dresses when marching in these public suffrage processions. Wilmer R. Kearns marched in parades in NYC and Washington, DC with the Men’s League for Woman Suffrage. When Edna was away for women’s rights conferences and organizing activities, Wilmer took responsibility for child care, answering the phone, and household responsibilities. Both Wilmer and Edna considered equality a priority in their own relationship. Wilmer worked as an accountant in Manhattan. This web platform is dedicated to their work and legacy—and in particular, the “Spirit of 1776” suffrage wagon used for organizing in New York City and on Long Island. The story of Edna Kearns has Woodstock, NY ties. See 2017 article in Woodstock Times (Woodstock, NY). Marguerite speaks about Edna Kearns in a 2014 podcast by Chick History. Check out videos highlighting the 1913 maiden voyage of the wagon and its trip from Manhattan to Long Island. Article from New York History blog: “Long Island’s Three Wagon Women: Rosalie Jones, Elisabeth Freeman, Edna Kearns. See more information about the wagon on this web site. Video about Wilmer Kearns, Edna’s husband. About Serena Kearns, Wilmer and Edna’s first child born 1905. About Marguerite Kearns, manager of Edna Buckman Kearns Suffrage Collection. 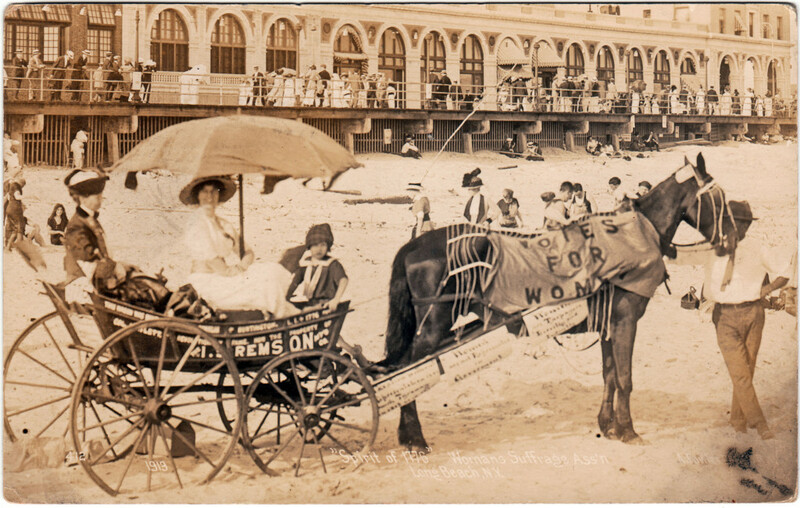 Edna Kearns, Wilmer Kearns and the “Spirit of 1776” suffrage wagon after 1920 in Pennsylvania. Bibliography and resources for Edna Kearns and “Spirit of 1776” wagon. Edna Kearns nominee for 2014 National Women’s History Project, Women of Character, Courage and Commitment. Follow Suffrage Wagon News Channel. In other sources—The 2017 publication of “Women Will Vote: Winning Suffrage in New York State by Susan Goodier and Karen Pastorello (Cornell University Press) notes: “Aside from suffrage leaders, very few workers left detailed records of their activities behind.” This makes the suffrage movement documentation by Edna Kearns and the archive she left behind even more valuable. Snapshots from the Life of Edna Kearns on Vimeo. 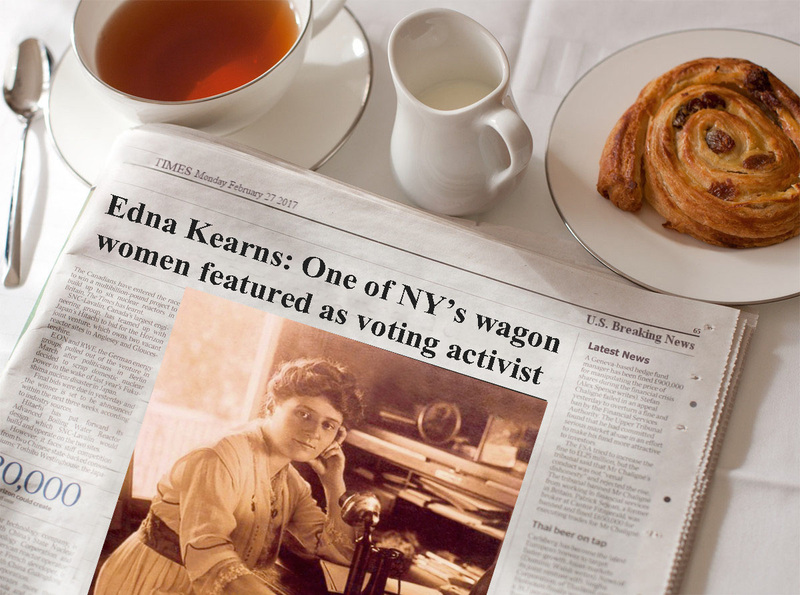 Edna B. Kearns, New York State suffrage activist! on Vimeo. Thank you for helping us all by honoring Edna, Wilmer and Serena. Edna’s keen intelligence and tenacity is written all over her face. Same goes for Marguerite! We owe a lot to the contributions of Edna Kearns and women like her. Grassroots suffrage organizers played such an important role in the women’s suffrage movement. I never knew the extent of Edna’s role in the “Spirit of 1776” suffrage campaign wagon. Thanks for sharing her story with us. It’s about time that the on the ground activists like Edna Kearns are getting the recognition they deserve. I’m supporting the 2020 suffrage centennial. Thnx. Quite a feat to lift one’s grandmother back into the action in NYS again.